Owners of 2014 on up models of the current-generation Chevy Colorado and GMC Canyon crew cab pickup trucks now have the option of added security measures. 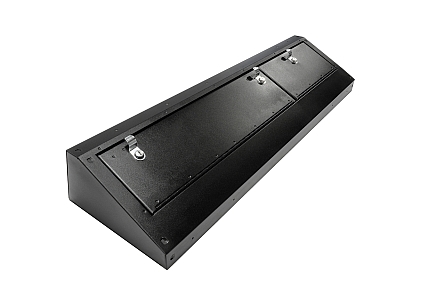 Tuffy Security Products has unveiled its Model 343 Under Rear Seat Lockbox designed to mount under the rear seats of the pickup. You can now drive around with your valuables and no longer worry about your stuff being stolen. The lockbox is comprised of powder coated 16 gauge steel and features more than 2,100 cubic inches of storage space which is further protected by Tuffy’s patented Pry-Guard locking system. Perhaps the best feature is that the box is concealed completely and neatly under the rear seats, and the installation is not a hassle. The Model 343 mounts into the vehicle by fastening to the original OEM hardware and does not require any drilling. All that is needed is basic hand tools to secure the lockbox into the pickup. The lockbox lids can be accessed by flipping either one or both of the rear seats up. Or if you opted for a base Chevrolet Colorado, no seats need to be moved at all. Whatever you carry of value or importance can now be safe and secure with Tuffy’s new security product. Find out more information about the Model 343 Lockbox for the 2014+ Chevy Colorado and GMC Canyon by visiting Tuffy’s website. The Chevy Colorado and GMC Canyon continue to offer more basic work truck models, where the 2019 Ford Ranger pickup truck will not. As a result, the $20,200 MSRP of the Chevy Colorado comes in a lot lower than the $25,395 Ford Ranger, though it’s very easy for a Chevy Colorado to breach $30,000 with a few desired options like a V6 and crew cab configuration. Regardless, the Tuffy Model 343 Lockbox will likely appeal to tradesman and active lifestyles alike. Most V6 Colorado and Canyons are $36k to $40k fully loaded with a Diesel they can go $45k or more. Few people buy the base trucks other than fleets. Most are over $30k and get about $4k to 6 k off. Note this box will use all the under seat space so what you carry needs to be in the box. If you have the GM Kicker Sub the not will not fit. That’s allot of cubic inches, sounds great! Till you realize it’s only 1.215 cubic feet! Big enough for all your gadgets, but I’m with Scott. Gotta have that base!